I guess that Oscar Bishop's excellent deep soul item would be the best known 45 from the tiny Rip-Cor label out of Flint, MI, but this little gem shouldn't be overlooked. The top side is a rocking R & B number complete with some great falsetto shrieks from Sammy, whose name might have been Sam Flourney if he wrote the flip Good By My Love. This fine ballad comes the period when all the various sources of soul music were coming together to form the genre so there are hints of doo wop here, some R & B balladry too. 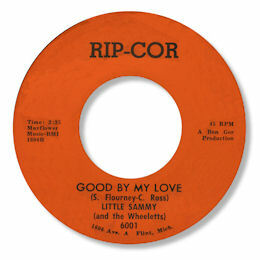 But surely Sammy's high tenor gospel flourishes make this an early deep soul song - and one to savour. UPDATE ~ The very knowledgeable Bosko Asanovic has written with some further info on Little Sammy - " Also from my files I picked out that Sam E. Solo is Sammy Wheeler from Flint, Michigan. For the life of me I have no idea where I got the above info, but it then make sense for the backing group to be named The Wheelettes with the surname Wheeler. If the above is true then Little Sammy must be Sam E. Solo on RUBY and IMPERIAL also."